At DDD6 last Saturday I gave my first micropresentation. Micropresentations, also known as Pecha Kucha (Japanese for "chit-chat"), are presentations of exactly 20 slides of exactly 20 seconds each. PowerPoint is set to automatically advance each slide so once you start the presentation going you have 6 minutes and 40 seconds to give your presentation and then you’re finished. I watched various members of the UK community give some very impressive micropresentations at MIX:UK 07 in London in September and thought I’d like to give it a go. I got my chance at the lunchtime slot at DDD6 where Zi Makki organises the grok talks presented by anyone who wants to have a go (BTW if you’d like to give grok talks or micropresentations a go I can thoroughly recommend it - contact your local user group or look out for DDD7). If you’d like to see how I got on Craig Murphy video’ed all of the grok talks and my micropresentation and when these get posted on either Craig’s site or the DDD site I will post another message. But if you can’t stand the wait and you really must see how I got on I cobbled together a recording of the PowerPoint deck and a sound recording I took and made a quick video (personally I would wait for Craig’s video because you get to see some wild man excitedly gesticulating and pointing frantically at the screen). You can download the video here and if you only want the slides you can get them here. So what did I learn from my first attempt at a micropresentation ? The preparation time for a micropresentation is completely disproportionate to the length of time of the presentation. The presentation is obviously 6 minutes and 40 seconds but I spent many hours preparing it. As you only have 20 seconds to show each point it really forces you to nail your demonstrations. I found it very interesting to take any demonstration that I wanted to give and reduce it to its constituent screen shots and add animations and graphics to highlight the essential pieces of information that I wanted to show. I am very grateful for having gone through this procedure because it really focuses the mind on being able to get to the point in the minimum amount of time, an approach which transfers to more traditional presentations very nicely. I used animations to simulate drawing on the screen. I like to use ZoomIt to draw on the screen to focus the audience’s attention on a particular point but obviously not only would it be not Pecha Kucha to interfere with the slides whilst they are running but also it takes valuable seconds to annotate the slide. So I added the annotations to the slides and animated their arrival on the slides after a given number of seconds that I just guessed at. Seemed to work ok though. I found it difficult to find 20 separate pieces of information about my subject until I started spreading subjects over slides. Pecha Kucha purists will probably be annoyed at my abuse of the format (e.g. repeating slides only changing them by the animations to illustrate new points, revisiting slides that have already be shown in order to consolidate a point). In the previous micropresentations that I had watched it seemed to me that one of the difficult parts of this format was in timing your speech so that it ended exactly as the slide moved on to the next point. If you ended before then there was a few seconds where the speaker is clearly waiting for the slide to move on (you can see this on at least 2 of the slides in my presentation). I thought I had a cunning plan to solve this problem. First I started looking for a digital egg timer that would count down in seconds and would reset back to 20 seconds after it hit zero. I couldn’t find one. Then Jesse Liberty suggested using a digital chess timer. I wasn’t able to find a timer that would count down and reset back to 20 seconds without a player having to press the "done" button so I simply set my timer to 6 minutes and 40 seconds. I reasoned that if I needed to look at the timer then it didn’t matter what the minutes digit showed or indeed what the tens of seconds digit showed because it would be very obvious to me whether I was in the first 10 seconds or a slide or the second 10 seconds of a slide. What I needed was the very last digit and seeing that it was, say, 3 or 4 seconds would tell me how close I was. I liked the theory. I practised using the digital chess timer and found it to be very helpful. Come the live presentation I set the timer on the desk and started it going as I started the presentation. I didn’t look at it once. Apart from the fact that I didn’t want the distraction the presence of the audience made me realise that I had to be looking at them and not at the timer. Tried it, didn’t like it, moved on. Something that I desperately wanted to get right was the ending of the presentation. I wanted to end exactly on the 6 minutes and 40 seconds mark. I didn’t. I ran over by 4 seconds. I was disappointed with myself for this. The presentation had ended and there was this black screen and I was still talking. Admittedly it was only 4 seconds in a presentation of 6 minutes and 40 seconds but I think ending your final word on the final second of the presentation is very impressive and I will strive to get this right next time. So what do I conclude from this ? It was fun. It was a lot of work for such a tiny amount of time. I thought people enjoyed watching the spectacle of someone being put under real pressure (I didn’t mind it either). I also thought people appreciated the basic point of Pecha Kucha: you have to make your points clearly and move on; there is no messing about and there is no delay and there is no digressing - you make your points and you get off. If you’re up for the challenge I have to say that I can recommend it. 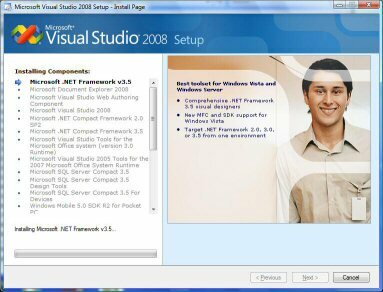 Visual Studio 2008 and the .NET Framework 3.5 were released on 19th November 2007 to MSDN subscribers and will be on general release early in 2008. I downloaded and attempted to install Visual Studio 2008 and this post describes the problem and the solution. Like most software problems it really helps to know what it is asking. In this case it isn’t actually asking for dotnetfx35setup.exe because if you download it separately and tell it where to find it then it simply asks you the question again. The only way you can see what the problem is is to run the .NET Framework 3.5 installation by itself. This reveals that it has to connect with another server to continue downloading the rest of the .NET Framework. Of course on a laptop without a network connection it can’t do this and the installation fails. Unfortunately the Visual Studio 2008 installation process tries to install the .NET Framework 3.5 silently so this rather important nugget is never revealed and the false error is given instead. The only solution to this problem is to get an internet connection. I’m not sure if Microsoft intend to make the dotnetfx35setup.exe redistributable self contained (such as a dotnetfx35.exe) but I certainly hope so - the idea of software that only works when you have an internet connection is a very frustrating one for someone who travels with a laptop. As many of you know I have been giving a presentation on Astoria a fair number of times over the last 8 weeks and it has been very interesting talking to everyone about the pros and cons of this client-side data access story for AJAX, Silverlight, XBAP and PopFly (etc.) applications. The good news is that at TechEd Developers Europe earlier this month Pablo Castro took time out to chat to me about some of the more architectural issues surrounding Astoria. You can download the 28 minute podcast here. Though the podcast should be useful for anyone it isn’t aimed at providing an introduction to Astoria. The assumption is that you have already gained some knowledge of this subject. For further background see the Astoria site and/or my slide deck. The December CTP should be coming out, well, in December and this moves us away from the proof of concept and much closer to an actual product. Stay tuned. For non-trivial applications, having a managed build process is essential. However, if that build process is irksome to use and requires a series of fiddly steps in order to complete it, developers/build folks will not been too keen to run it frequently. This is a shame because a repeatable, fast and easy to use build process increases confidence and product quality. Thankfully there are tools available to help us automate the build process, FinalBuilder is one such tool. Automating the build involves scripting every action that you need in order to compile, test, deploy and re-test your application. Everything from pressing F5-Compile through to creating a setup.exe (MSI, installer, etc. ), copying into a [clean] virtual machine, setting up database connections, sending e-mail, creating images, posting blog entries, burning CDs, starting/stopping IIS, version control integration...they are all part of the automation process. Over the course of this session Craig will explain the need for automating the build process and will demonstrate VSoft’s FinalBuilder tool (and Automise if time permits). Craig does not have any formal connection with VSoft, he is just evangelical about their product! With Test-Driven Development (TDD) now entering the mainstream via such tools as NUnit and more recently xUnit.net, it is becoming an important tool to have in your developer tool chest. If you are wondering how to "get more" from TDD, code coverage could well be part of the answer. I believe that we can improve the quality of our application by using a combination of TDD and code coverage. Code coverage, whereby we "track" how much of our code is covered during testing, is not new. Indeed, we can practice code coverage and TDD in isolation. However, applying what we know about code coverage against our unit tests allows us to move our applications to the next "quality" level: no longer is it acceptable to have unit tests on their own, we must know how well written the unit tests are, how much of the classes under test are really being tested? Over the course of 60-75 minutes Craig will introduce the benefits of code coverage using both manual methods and automated tools. He will briefly introduce TDD and will go on to demonstrate the benefits of using code coverage tools against your unit tests, i.e. how well do your tests exercise your classes/application? Craig will be using Visual Studio 2005 and C# - his demonstrations are available for Visual Basic.NET and Borland compilers too. Craig lives and breathes this stuff so everyone can be sure to get some solid, in-depth coverage of these subjects. For details go here. Monday, November 26, 2007DotNetDevNet: What Can You Do With XNA ? Mick Lohan of GAMTUG (Galway Area Microsoft Technology Users Group) fame is organising "Craggily Island" an Irish Developer Day in Galway to be held on Saturday 3rd May 2008. Details are a bit sketchy at the moment but it will have 5 tracks and have some similarities with DDD. The Call For Speakers is open and you can send your proposals to Mick Lohan himself. As they say, there can be only one so if you live in Ireland be part of history and be at the very first one. Those SQLBits chaps are at it again. SQLBits II will be held on Saturday 1st March 2008 at the new location of Aston University Lakeside Conference Centre in Birmingham. SQLBits is a free, one day event on all things SQL. Yesterday (19th November 2007) Microsoft released Visual Studio 2008 and the .NET Framework 3.5 to MSDN subscribers. If you have a subscription you can download the 3.3GB for the Professional edition right now. And also note that when Microsoft said "before the end of November" it wasn’t 30th November. Everyone with a cynical hat must take it off now and look sheepish for an hour.